I’ve written about Frankenstein as a pair of classic movies, as an award-winning parody, as the basis of a whacky sixties comedy, and I’ve mentioned it many times while talking about the history of science fiction, but I’ve never written a post just about the original novel published in 1818. I’m obviously long overdue, and since something I saw on line earlier this week almost made me type a twitter storm of irritated commentary, I figure that now is as good a time as any to remedy the situation. The full title of the novel is Frankenstein, or The Modern Prometheus, and Mary Shelley famously wrote the short “ghost story” that would eventually become the novel in 1816 while she and the man who would later become her husband were at Lake Geneva, Switzerland, spending a lot of time with Lord Byron. The novel was published in 1818 in a limited run as a tthree-volumn set without the author’s name. After a successful run of a play based on the novel, a second edition, listing Mary as the author, was published in 1823. Finally, in 1831 a heavily revised edition was published, and for the first time made available at a “popular edition” price. Most people think they know the story of Frankenstein, but few have actually read the book. And as a fairly typical novel of its time, the very slow burn of the story, not to mention the surfeit of complex sentences and frequently mini-monologues of all the characters can make it a difficult read for modern readers. Even the structure of the novel is different than typical modern books. The novel is told in the first person, but from three different viewpoints. It begins from the viewpoint of the captain of a sea vessel that has been trapped in the Arctic ice, who finds a half-dead man similarly marooned. The man identifies himself as Victor Frankenstein, and then tells the captain how he came to transform a body assembled from corpses into a living being, then horrified at how hideous is looked (not anything it actually did), that he rejected it, drove it away, fervently hoping it was die in the forest since it had no skills, couldn’t talk, et cetera, and then tried to go back to his life. The middle of the book is from the creature’s point of view (though still filtered, because the creature eventually found Victor and told him the story, which Victor is now telling to the captain who is writing all of this down for us). The creature did not die. He took shelter new the cottage of a family that lived in the woods, and by watching them learned to speak, eventually learned to read, and came to hope that he might not die alone in the world. The grandfather of the family was blind, and the creature struck up a friendship with him, carefully only coming around when the old man was alone (since every person who had laid eyes on the creature up to that point had been so horrified by his appearances as to scream and chase him away). Alas, the rest of the family catches him once, and they have the usual reaction, sending the creature fleeing deeper into the woods. The creature finds Victor, explains all of this, and then asks Victor to create a second person like himself, to be his companion and mate. Victor agrees. The next part is back to Victor’s point of view, and Victor begins assembling body parts in secret again, but he suddenly becomes afraid of what will happen if the creature and his mate can actually reproduce. I emphasize at this point that here at more than two thirds of the way through the novel the creature hasn’t harmed anyone, hasn’t threatened anyone, has not behaved in any way other than as frightened child. But Victor suddenly decides that he can’t let the creature have a companion, he destroys the body parts, tells the creature he will not help him after all. The creature loses it, and eventually decides the best way to get his revenge on Victor is to start killing people Victor loves. Victor tries and fails to kill the creature, and they wind up chasing each other across northern Europe and into the Arctic. Finally, we return to the viewpoint of the sea captain, as Victor gives a last monologue and dies. The creature find the ship, has a conversation with the captain in which he agrees that he has done terrible things, and explains that his intention had been to lure Victor to a spot where the creature could kill him, and then not just kill himself, but set himself on fire in a place where no one would be able to study his body and figure out how Victor did it. And that’s where it ends. Like any work of art, everyone interprets the story differently. A little over a year ago there was a bit of a kerfluffle when one newspaper ran a story about how modern readers feel sympathy for the creature with a headline that referred to such students as “snowflakes.” There seemed to be an assumption that having sympathy for the creature—seeing him as misunderstood and a victim—was some sort of modern politically correct reaction. There’s a big problem with that: the original novel actually does portray the creature as a victim and as being misunderstood. And that’s not interpretation, it is literally what happens in the story. Not to say the story makes him a blameless victim, and certainly how the creature takes his revenge by killing innocent people beloved by Victor is an evil act. But it is an act of revenge. And the book frames it that way. Lots of people assume that the theme of the book is that there are some things which mortals are not meant to know, and that if mere humans try to play god horrible things will happen. But that isn’t really Victor’s sin. 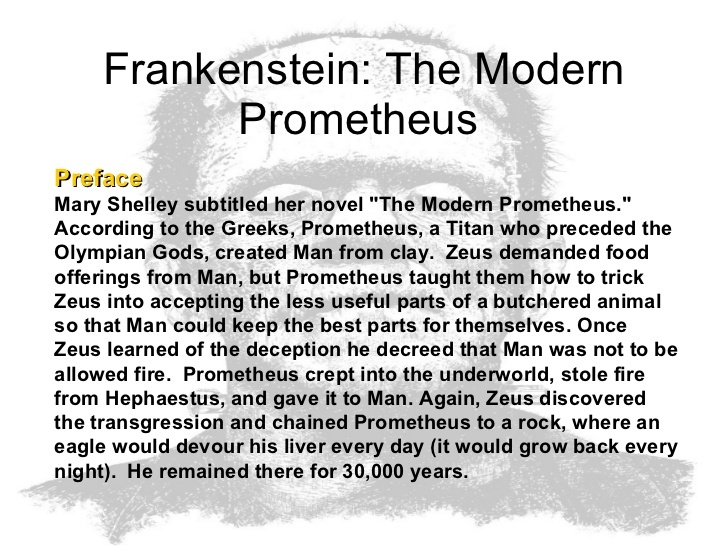 We get a hint of that in the title itself: Frankenstein, or The Modern Prometheus. Prometheus was not a mortal who stole from the gods, Prometheus was one of the gods (yes technically a Titan, but that was just the name in Greek mythology for the first generation of gods). And what Prometheus was ultimately punished for was giving humans the gift of fire, then not making sure they would use it responsibly. Victor’s sin, then, is that he gave life to a creature, and then abandoned it, rather than caring for it. As the creatures creator, he had a responsibility to teach it how to get along in the world, to know right from wrong, and so on. He didn’t do that. And he drove the creature away not because of anything the creature did, but simply because of the creature’s hideous appearance. The middle narrative, when the creature tries to teach himself how to be a good person, is the next big clue as to the real them. The creature naturally craves love and the comfort of companionship, and he tries to learn how to be a member of society. He befriends the blind man and earns his trust. It is only when once again people see him and assume because of his looks that he must be a dangerous, evil thing, that he abandons his plan to try to become part of the human community. Victor goes on, unfortunately, in that monologue to insist that he was right to abandon the creature, but his rationalization only works by assuming that somehow he knew how the creature would react to yet another betrayal. Finally, we have the creature’s final plan: he had already destroyed the remaining records of Victor’s experiments (those that Victor hadn’t destroyed himself), then set out to kill both Victor and himself so that no one could have create another creature like himself. Before Victor died, he had admitted to the captain that the creature had been leaving clues to make sure that Victor was still pursuing him. The creature had thought it out: Victor was the only one who knew how he had reanimated dead flesh, but it was possible that another could study the creature’s corpse and figure it out, so the creature needed to kill Victor, and then he needed to destroy himself. He planned to set himself on fire somewhere on the arctic ice precisely because any remains would eventually wind up lost in the sea. In other words, he was cleaning up Victor’s mess. There are plenty of quotes one can pull from Victor’s and the creature’s monologues to support the usual interpretation that this was all about an arrogant scientist treading into areas best left alone. But those are all perspectives of characters within the narrative. Just because a character says something, that doesn’t mean it is what the author believes—it’s something the author thinks the character must believe in order for their actions to make sense. I’ve said many times that an author’s values and beliefs manifest not necessarily in the words of the characters, but in the consequences of the actions of characters, and how the way the narrative portrays them shows you whether the author thinks those consequences are deserved. It’s very clear from that perspective that yes, both Victor and his creation have done deplorable, immoral things. But it is also clear which of them realizes it and takes personal responsibility for it. Victor blames the creature for everything, including his own actions, up to his dying breath. The creature blames both Victor and himself for the various atrocities, and in taking the blame, pronounces (and then carries out) his own death sentence. Which means that ultimately, it isn’t the creature who is the monster.